Surf's UP Dude! What a great personalized ornament to give your special surfer! 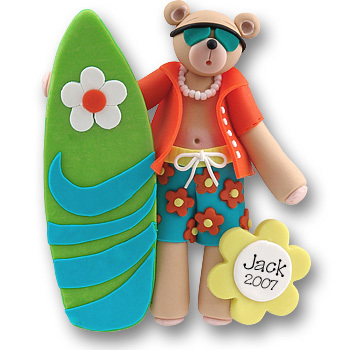 This adorable Belly Bear surfer is ready to hit the waves. He is totally decked out right down to his Pooka Beads. He is handmade from polymer clay and is designed by Debi Allison. AWESOME!! This is one of Deb's Limited Edition ornaments and there are just a few available.